Comments, posts and images from Road Races and Road Relay events. The AFD handicap is a great day, dragging runners and families alike out of the house at Christmas. Anyone involved with AFD is welcome to run, including the parents of AFD members, past illustrious AFD parents have included the Dad’s of Steph Twell, Jonny Hay and Josh Grace. I even had a go once :). The idea is simple, everyone puts down their 5K PB, or has a guess at it if they have yet to do one, then the runners are set of at intervals with the aim being to try and get as many finishing as close together as possible, so if the slowest runner is going to take 30mins, and the quickest runner is going to take 15mins then the quickest runner would be released from the start some 15 minutes behind the slowest. It’s a great day, and a great run for the fast guys and girls who often have nobody to chase with the format starting them last and forcing them to race. A lovely day to be honest, not as cold as previous years and no ice on the route led to a good morning out for all involved. Robbie managed to complete the route in 15:52, which knocked of a good 90 seconds from his previous 5k PB, though to be fair it’s been a while since he has done one. Congratulations to everyone who joined in, from the regulars to the new and very young talent enjoying their first AFD Christmas. 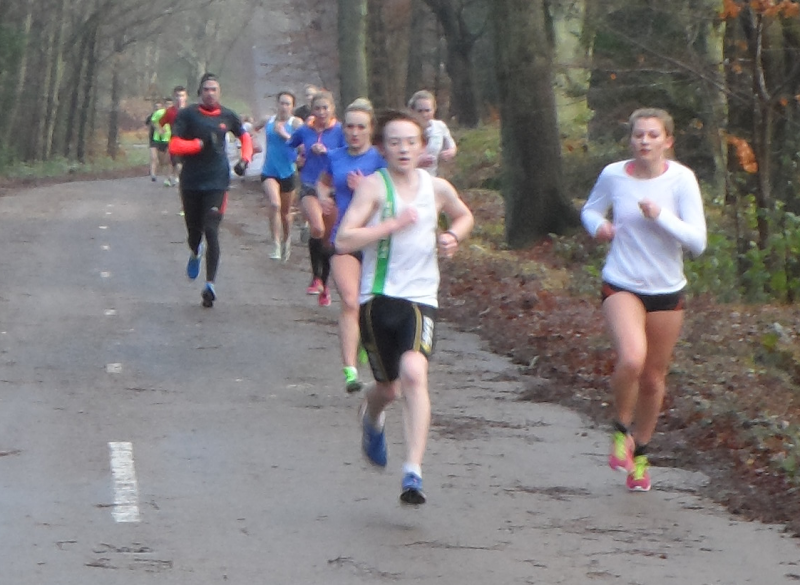 Surprisingly the National Road Relays was held slightly North of the Southerns in it’s usual location of Sutton Park, Sutton Coldfield. AFD didn’t spend so much time on the podium today, but everyone that was available put a good show in. 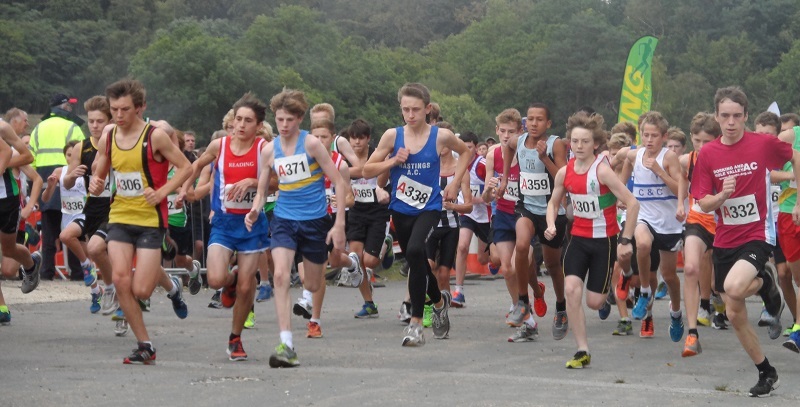 The Youth section of the Road Relays didn’t have many notable performances, with only the U13B, U17W and U17M making the top ten. A very good performance from the U13B though, with the team coming 2nd overall and Harry Hyde placing 2nd in the fastest individuals, ansimularly great performance from the U17W with the team getting our only Junior Gold, and Lucy Pygott placing 2nd to take our 2nd Individual Silver. AFD raced well in the Senior Mens event with Josh Grace finishing 1st in leg one, and achieving 6th place overall in the Individual Table, with the team placing 8th overall, once again AFD pride was carried on the back of the Senior Women who managed to get 2 teams in the top 10, placing 1st and 10th with Emily Hosker Thornhill bringing AFD up in to 2nd place in the 3rd stage ane Louise Small running an excellent final leg, placing 4th overall in the Individual table and bringing AFD Senior Women to the 1st place and Gold Medal place in the team event. 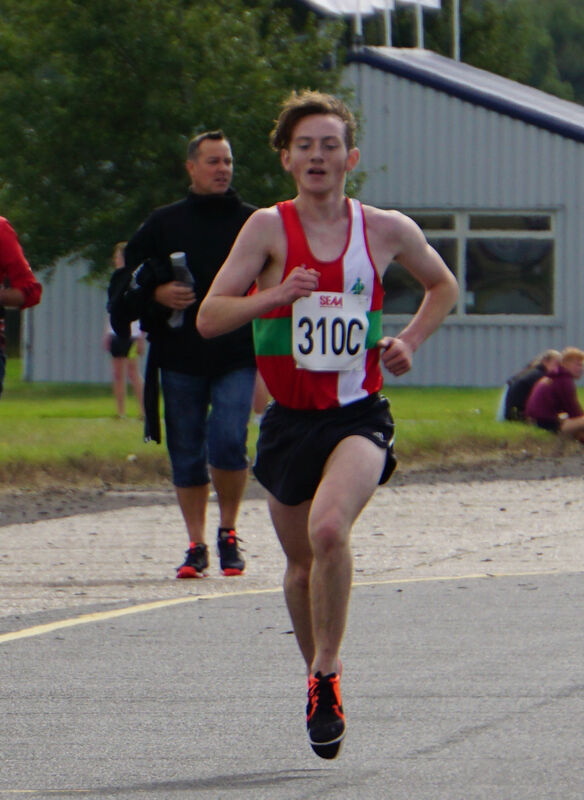 Robbie had a good run in the U17M’s race, having suffered badly with a chesty cold for almost two weeks, and missing a couple of training sessions because of it, speed and performacne were not expected to be great, especially given the short period of time he has actually been back at full training since his summer injury. He hoped for a sub 12min run and was somewhat dissapointed to only achieve 12:12 but giving the circumstances not a bad run. Once again Robbie took on the mantle of middle man, picking up the batton from Olly Percival who ran the 1st stage in 12:30, handing over in 19th position, Robbie picked off a list of individuals to take AFD up to 9th place, handing on to Max Heydn who picked off a further 2 runners and brought AFD up to 7th place and comlpeted his stage in 12:32. All in all not a bad day out, even Jade came to watch, not that she saw much of the racing, she spent the whole day cuddling Trex, but hey, she’s been at Uni for a whole week so is bound to be missing him. Robbie working hard, tired and feeling it. I know I may well have mentioned this before, but the usual, round the corner trip to the Southern Road Relays was somewhat extended this year. That and the closure of the M1 meant a long and extended trip out to Bedford for the relays. Despite the extended travelling times AFD still managed to shine, winning both the Senior Mens and Senior Womens events by very impressive margins. The Bedford Autodrome provided a very flat and exposed circuit for all races, the wind whipping across the open spaces to steal breath from the very lungs of the athletes, but still they ran. Robbie’s first race since his foot injury, so some questions in mind on just how well he would perform, but questions smashed away on the day as he stepped up to take the 3rd stage of the 4 stage 4.5k relays, a stage that he completed in the more than acceptable time of 14 mins 35 seconds. Times and Postions are not yet available, and given the issues on the day, may never be available, so at present we don’t really know how he performed on the grand scale, but it was a great run, especially after such a long time away. Well done Robbie Coupland, well done AFD, and I have to say what a delight it was to watch Andy Vernon storm around stage 6 of the senior mens race. 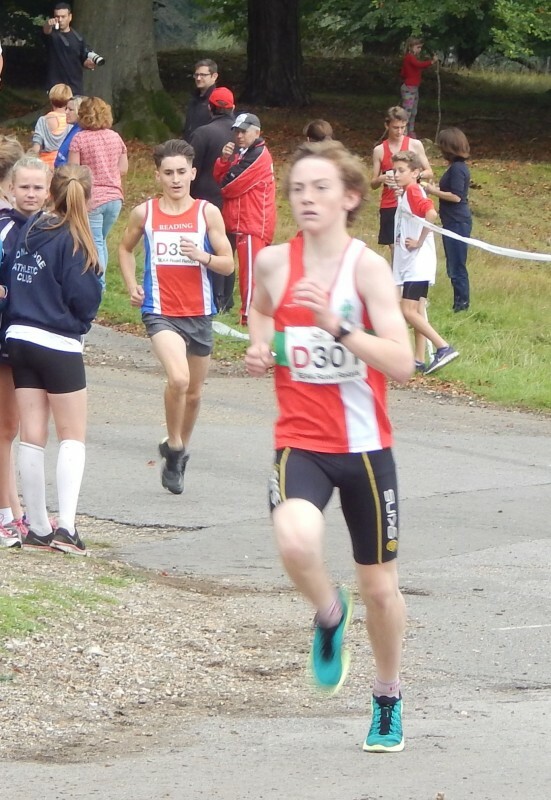 A very impressive performance completing 6k in 16:48, with AFD’s Josh Grace 2nd fastest on the day in 17:22, the AFD overall winning time for the 6 stage senior mens event being 1:46:12, some 2 minutes ahead of second place Tonbridge. Despite the venue change Robbie still manages to keep both feet off the ground. Well done to all the competitors in today’s Southern Road Relays, some excellent running and a great event to watch. Aldershot had a strong U17 men’s team this year, made up of Ollie Percival, Robbie Coupland, Jack Boswell and Jake Cvetkovic, but as always they were up against some very strong opposition including last years winners and favorites Tonbridge and last years 3rd place Cambridge, both of which looked as strong, if not stronger than last years teams. As it went they both turned out to be very strong, with Tonbridge grabbing Gold, Cambridge seizing silver and AFD blasting out some excellent running to blag bronze. 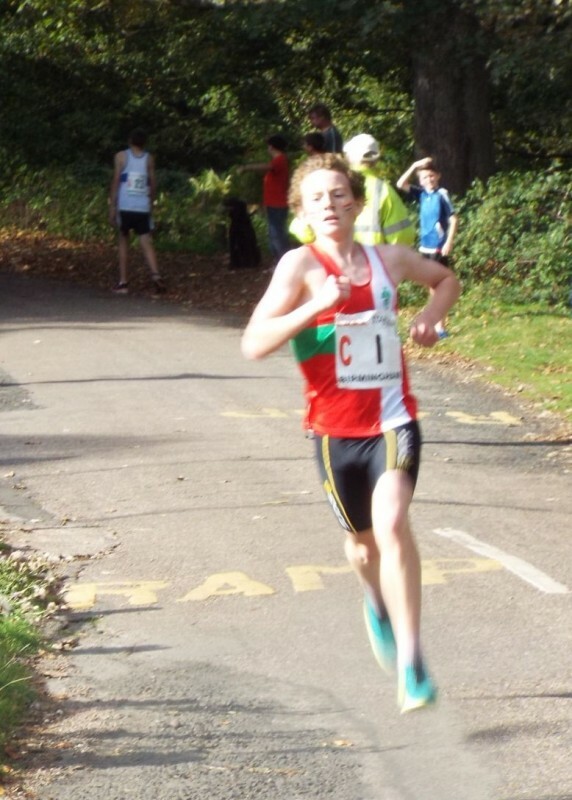 Great to watch the club race itself out on the roads of Aldershot today, some excellent performances were put in, notably Johnny Hay flying through the field after starting last, Jack Boswell powering along to an exceptional 15’36” 5k time. Robbie finished 11th taking in to account the handicap, clocking up (we think) the 7th fastest time on the day completing the 5k in 16’37”. His target time was 16’30” so very slightly behind, but not bad and still improving kicking the illness induced cobwebs out of the system. After a great performance in the Southern Road Relays AFD headed up to Sutton Park in Birmingham to try for a repeat performance. Unfortunately it wasn’t to be, despite some good performances they ultimately finished 8th on the day. 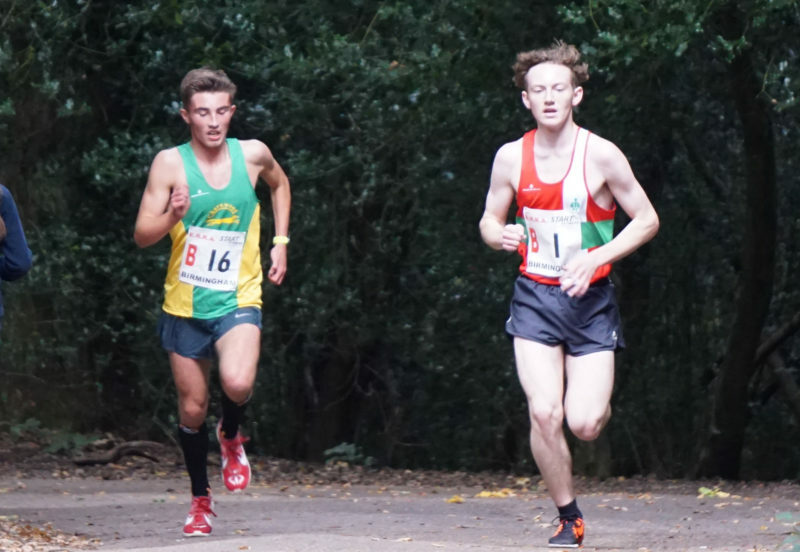 Some excellent performances swayed the overall results with the top three performances on the day coming from Callum Abberley from Burton AC(12:20), Chey Kemp from Reading AC(12:27) and Joseph Pollard from Charnwood AC (12:28). Robbie anchored the AFD A team making 5 places up on the 3rd and final leg to secure the 8th place position, finishing with a time of 12:48, making him the 5th fastest in the 3rd leg, and 15th fastest overall. Altogether a good performance, but more is yet to come, roll on the National XC relays. Robbie in his War Paint entering the final straight. 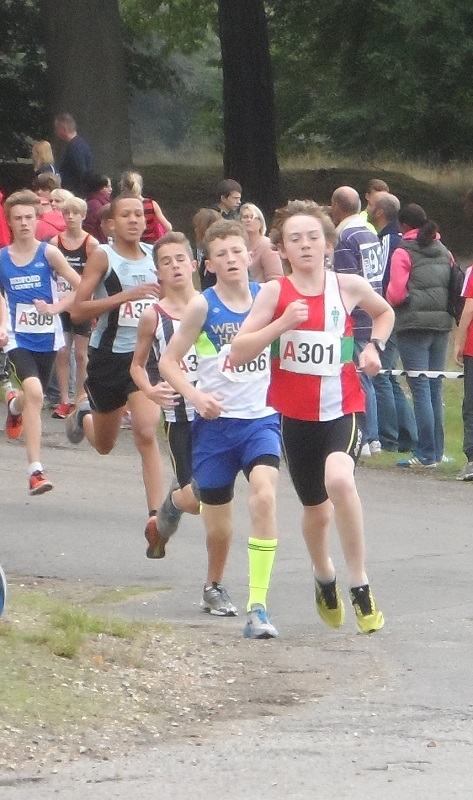 Robbie’s 6th outing in the Southern Road Relays for AFD, sees him anchoring up the U15 A Team. A strong field of young men, with an exceptional team of boys from Shafstbury sees Robbie start his 4th leg in 4th position, well behind the Shafstbury leading team, and some seconds behind the 2nd and 3rd place runners. Robbie starts of hard and is quickly closing down the gap between him and 3rd place, but Chey Kemp of Reading, in 5th place is closing the gap to Robbie even quicker, and as they disappear behind the second row of trees Chey is right on Robbie’s shoulder. A large loop later and the boys come blasting back in to the arena, Shafstbury still way out in front, but now Robbie is in second place, with Chey Kemp happy to sit on his shoulder, the down hill stretch, and the road to the finish begins, Chey overtakes Robbie but no one else is close so it becomes comfortable Bronze for the AFD boys. Looking at the talent available, getting a medal of any form was a real bonus. Well done AFD. This is the fourth 5k handicap Robbie has run in, I have run in one myself and was seriously considering having another go this year, but bottled it on the day, I need someone out there to kick me up the arse and make me do it next year. The race is slightly different to most, the handicap is worked out in advance and runners start based on their expected times, so for instance if Joe expected to do the 5k in 30mins, he might start first, Pete can do the 5k in 25 mins, so he starts 5 mins after Joe etc. etc. Robbie was quite ambitious this year, having completed the 5k in 18’40” last year he upped his expected runtime to 17’30”, hoping to knock a whole minute and 10 seconds off his time. Positions are always a little fluffy, because of course everything depends on the accuracy of the estimated times, Robbie finished 15th in the actual standings, not sure where he would be ranked if it was done on time only, but he did complete the race in an excellent 17’12” ultimately knocking off 1’28”. This also now represents his fastest ever 5k, previously 18’02” set in a Park Run at Basingstoke April 2013. 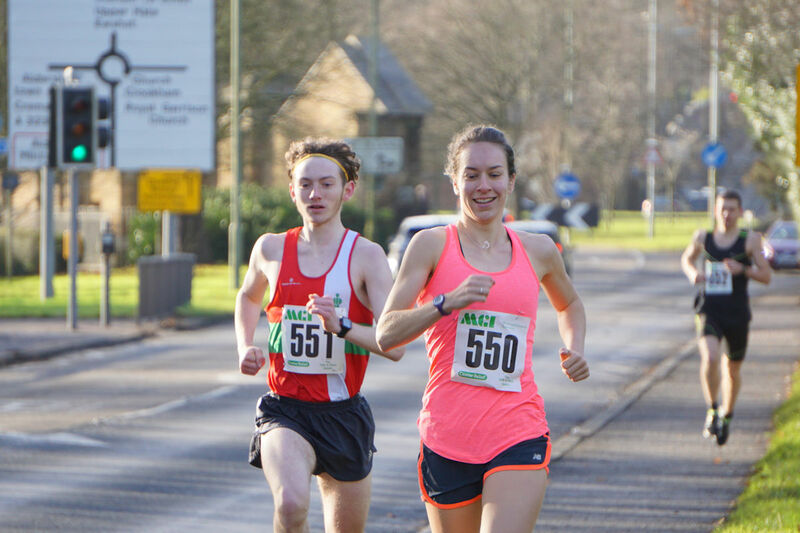 Coming in to the final bend in the AFD Boxing day 5k. It doesn’t seem long since the last National Road Relays, oh it isn’t due to weather they were run some 6 months ago, not a year ago. But irrelevant to timings and weather predicaments from last season, this years went ahead on time and as smoothly as can be expected. The rain may not have caused a cancellation this year, but it certainly showed it’s face a wet and muddy site had some parental taxi services concerned that they may not be able to leave the car park by the end of the day. Robbie had an excellent run, picking up the rains from Jake Cvetkovic, who completed the first leg in 9th place with an excellent time of 12:57, he pushed forward to complete the second leg in 13:14 seconds pulling AFD up in to 5th position, the last leg was run in the awesome time of 12:21 by Jack Boswell, this being the second fastest individual leg by an U15 boy on the day. Despite the excellent performances of all three runners it was not quite enough to get in to the medal standings, the team managing 4th place. 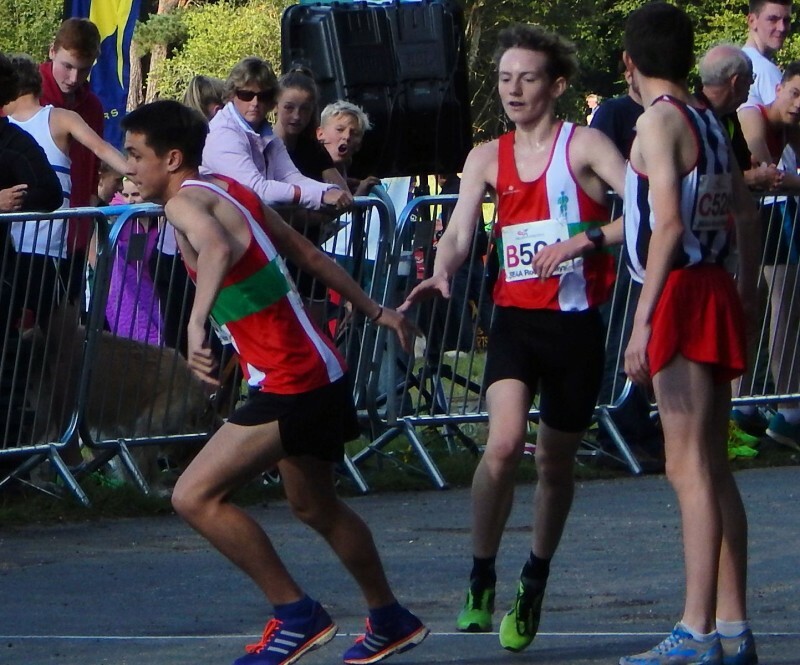 Still 4th place in the National Road Relays is an excellent result in anyone’s book, and at an individual level the boys all had outstanding performances. 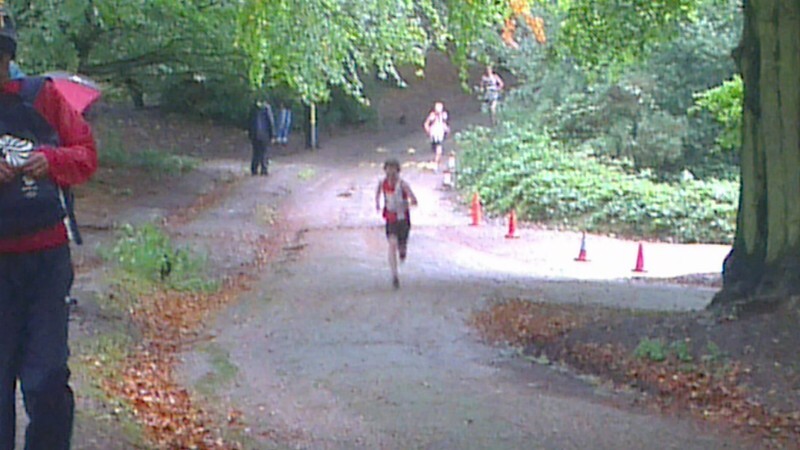 The last hill before the finishing straight, with Robbie working hard and chasing down the 4th place runner. A complete breakdown of AFD performances. A good showing, in numbers, for AFD with all groups entering multiple teams. Another excellent day for the Southern Road Relays, it’s been 5 years for Robbie, and still no sign of rain. I’m sure we will make up for that during the Cross Country season though. The teams stayed pretty much as given on my previous post, which has now been updated with the runners times. For those who can’t be bothered, or haven’t got time to look back a post, Robbie ran an excellent time finishing the 3k course in 10:10, setting a good pace, time and position for the AFD A team who finished in 3rd place overall thanks to an outstanding performance from Anchor man Jack Boswell. Team time was 39:57, with Tonbridge winning in 38:15, followed by Bedford in 39:05. A busy start to the race, shows the difference in size and stature of the boys and a deep concentration on Robbie’s face as they storm away from the line. The next view of Robbie is as he comes down the hill on to the corner by the AFD tent, fondly dubbed the flying corner as all previous years we have managed to photograph Robbie storming round the corner with both feet in mid air, and this year we did it again. Float Like a Butterfly, run like a Cheater. And with the race finished, the boys step up to collect their Bronze medals. 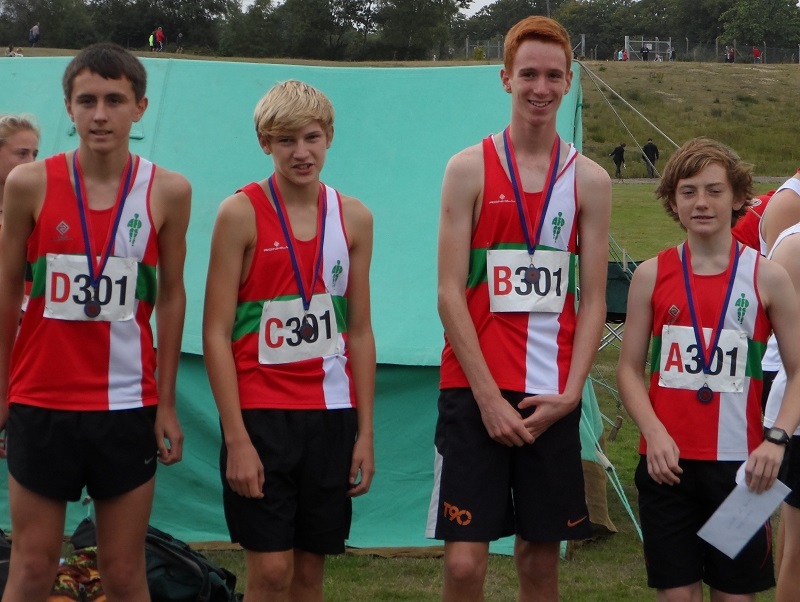 Well done AFD U15 Boys, a great performance from everyone in the club, with some excellent times all round. Medals were short on the day, but determination, desire and effort were in full force.